This is one of the most gorgeous looking and aromatic Persian mixed polows, requiring extra time and effort, but absolutely rewarding when prepared in authentic (Shirazi) way. Ground veal or beef, 1/ kg. Onion, thinly sliced, 3 large. Cabbage, cored and shredded, 1 head (about 1 kg.). Oil — 1/3 cup . Herbs: Basil, and tarragon, one large bunch each, chives and parsley, half a bunch each. All fresh herbs should be chopped and mixed. Kalam polow dried herb mix is also available in Iranian supermarkets and could be used without any problem! Sour grape juice, aab-ghooreh, (or 4 tbsp. sour orange juice), 1 tbs of dried powder of sour grape juice could be replace with both of the above noted types of juices. Chickpea flour, ard nokhodchi, 1 tbs. 2. Heat half the oil in a frying pan and prepare piaz daagh with 2 of the onions, but don’t make it crunchy. Just sauté the onion until golden. Remove it to a bowl. In the same pan, sauté the shredded cabbage over medium heat until wilted. Then, add pinch of salt, pepper, aab-ghooreh and 1 tbs. water OR 4 tbsp sour orange juice. Cover with a lit. Steam cook for half an hour. Once ready, remove to the same bowl with fried onion. 3. Mix 1 grated onion with ground meat, turmeric, chickpea flour, and pinch of salt and pepper. Use your hand and fingers (not a blender) to massage and mix them very well, like you would for kebab koobideh. Then, make it into a large bowl and leave to rest for 10 minutes. Now you should make this large meat bowl into very small, ideally same size, meat bowls before frying them in hot oil till brownish. A lot of people fry the meat in fried onion, pretty much like we do in ground mixed polow, and then mix it with the fried cabbage. This is no doubt an easier way, but by no means is it called kalam polow shirazi! 4.Once little meat bowls are ready, return them to the mix of fried cabbage and onion in a frying pan. Add chopped herbs and stir for 2 minutes, just so to mix everything together. If you used dried herbs, soak them all in a colander placed in a bowl of water for 10 minutes. Then remove from the water, shake off the excess water and fry in the mix like you would fresh herbs. 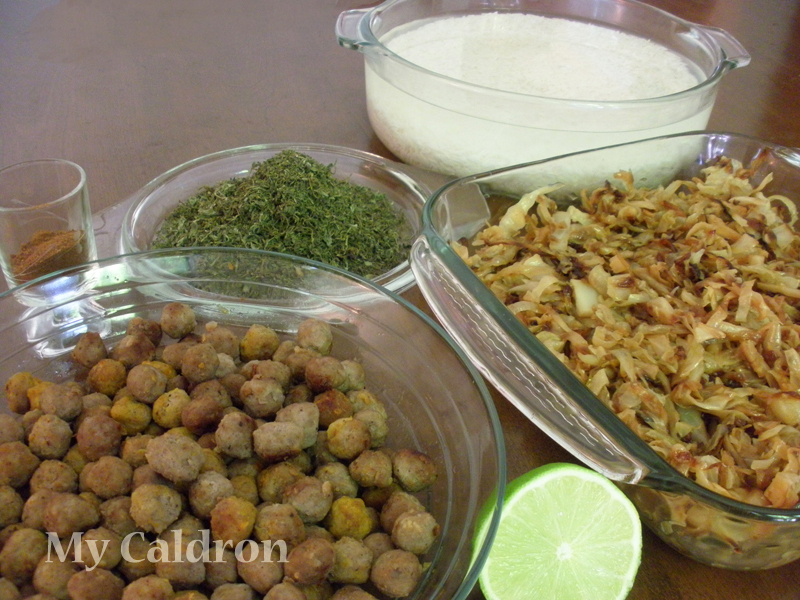 Your heavenly smelling and savory mix of slightly sour fried onion, cabbage, mixed herb, dotted with brownish little meatballs are ready to go back in the first stage above, into the rice! Cover the pot’s lid in a clean kitchen towel once you have sufficient steam in the pot and steam cook for one hour. Flat bread goes well with kalam polow as its tahdig. 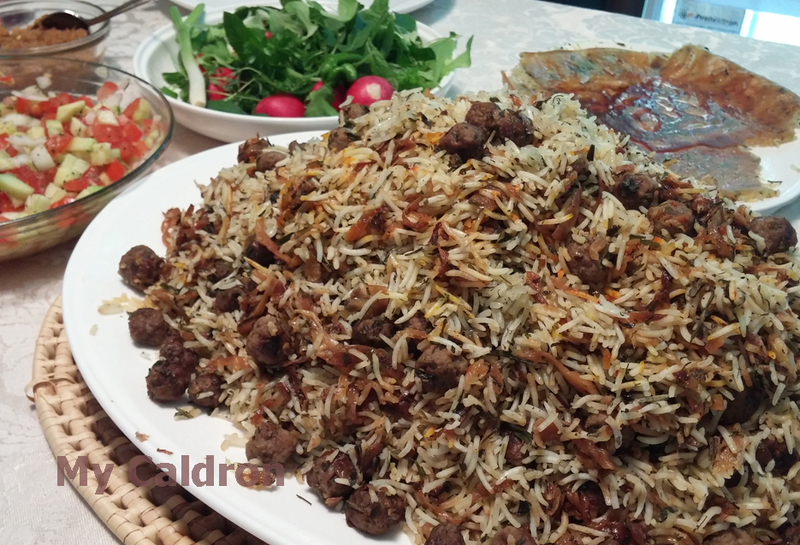 And, needless to say, the dish is never completed without torshi and shirazi salad. زیبا خانوم دست شما درد نکنه, عجب عکس جذابی از کلم پلو گرفته بودید، من که دهن آب افتاد! به امید آزادی ایران از دست ویروس آخوند و مذهب سیاسی!! مرسی‌، مرسی‌ 🙂 و به امید آن روز! daste shoma dard nakone, man chand ta doste shirazi daram, inghadr az in ghaza tarif kardan ke mikham in akhare hafte davateshon konam o barashon dorost konam, ta hala dorost nakardam vali ashpazim bad nist, omidvaram khob dar biad. nemidonam dobare key in ghaza ro dorost konam vali khodam ke kheili azash razi hastam, daste shoma ham dard nakone ke zahmate recip ro keshidid. dostanam hamegy azatoon tashakor kardan. p.s: age Holland tashrif avordin,khoshhal mishim dar khedmat bashim. Where can I find a recipe for your jeweled rice featured in the blog banner?